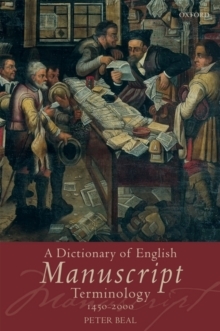 This is the first Dictionary of English Manuscript Terminology ever to be published. Dealing with the subject of documentation - which affects everyone's lives (from every-day letters, notes, and shopping lists to far-reaching legal instruments, if not autograph literary masterpieces) - Peter Beal defines, in a lively and accessible style, some 1,500 terms relating to manuscripts and their production and use in Britain from 1450 to the present day. Theentries, which range in length from one line to nearly a hundred lines each, cover terms defining types of manuscript, their physical features and materials, writing implements, writing surfaces, scribes and other writing agents, scripts, postal markings, and seals, as well as subjects relating to literature,bibliography, archives, palaeography, the editing and printing of manuscripts, dating, conservation, and such fields as cartography, commerce, heraldry, law, and military and naval matters. The book includes 96 illustrations showing many of the features described.